We love working on projects with our friends at Graceland Fruit. 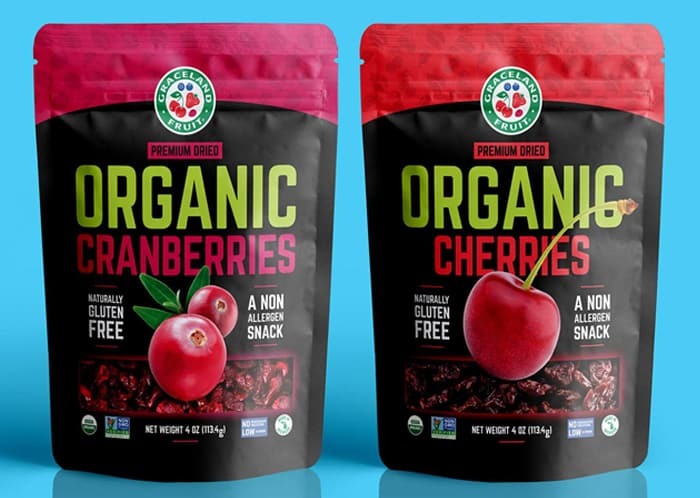 Because of this, when one of the largest providers of dried fruits in the world asked us if we wanted to design retail packaging for their newest organic products, we answered with a big, gigantic, YES! These awesome custom retail packaging bags landed on store shelves in Summer 2017, and were the focus of several out-of-door advertising campaigns. Both we and the client were ecstatic about seeing the retail package design come together in such a perfect way. And on a side note, these are some of the most delicious organic cherries and cranberries on the market! Seriously, no hype, you’ve got to try them! The packaging was designed to meet federal guidelines and compliance standards for labeling including nutrition facts, ingredients, bar code placement, and the display of certifications. This design project started from the ground up and included multiple rounds of mockups, revisions, and feedback. The final product was delivered to Graceland as fully realizes print ready files. Printing on packaging substrates can be a challenge for even seasoned designers (font size, ink choice, bleed, folds, transparencies). We helped to ensure that the final product looked perfect on the store shelves. We helped our client create new product packaging for use in the grocery store marketplace. We began the process by looking at our client’s current packaging and product branding—we then moved on to looking at the marketplace along with researching and evaluating the competition competition. After doing the initial research, we worked with the client to brainstorm some possible ideas and created some initial sketches and concepts. From these initial ideas we created several packaging concepts for client review. Through client feedback and discussion, we created mock-ups and 3-D renderings of the selected concepts and began the iteration process. As we neared the delivery date, we made design adjustments and refined the concepts into a completely fleshed out design for a final refinement phase. At this point we also researched and made adjustments to ensure compliance with federal guidelines (along with final client requests). Finally, we created and delivered the print ready files for the retail package design to the client.